Tonight, I went to see my friend's band, The Necrophiles, at Monterey, a small bar in Fort Lauderdale. I brought my Nikon D7000 and Nikkor 35mm f/1.8 lens. I really think the D7000 is superior to the Canon 7D for shooting video in low light. I've been a professional still photographer for over 10 years but I'm just getting started with video. I shot some video with my D90 but I wasn't impressed. With the D7000, I can shoot in situations like this dimly lit bar and it looks like something from a movie set. Take a look at the establishing shots of the bar at the beginning of the video and see if you don't agree. I just started learning how to edit video in Adobe Premiere so my skills are very basic. My lesson for this video was adding titles and fading them in and out. I'll get better. You have to start somewhere. I recorded the audio using the D7000's built in microphone. While it isn't horrible, its a good thing the band wasn't very loud. The D7000 has a stereo input jack so I definitely need to look into an external recorder like a Zoom H2 or H4N. Go ahead and laugh at my video! I know its odd to say the least. If you're wondering what I was thinking when I made it, please read on. First, I'm exploring the capabilities of my Nikon D7000 camera. It seems to be an excellent tool for making high definition, film quality videos. I have a number of super sharp, Nikkor prime lenses and I'm excited about working on some short film projects in the future. Before I can do that, I have to learn the camera. Obviously, the camera work for this video was simple. I used a Nikkor 35mm f/1.8 lens and my exposure was f4 1/30 and ISO 800. The incandescent fixtures in my kitchen were the only light source so I set the white balance to 3000K. The camera was on a sturdy tripod and I manually focused the lens. Finally, if you want my raw bread recipe, go to my Facebook page, open my photo albums, select the Raw Food album, and find the recipe under the photo of the raw bread. Its my birthday today and I'm just about a year older than I was last year. My friend Michelle asked me if I wanted to do a lingerie shoot on location at some big mansion in West Palm Beach. I usually don't make plans on my birthday so I accepted the offer. I've known Michelle a long time and we always have fun when we shoot. A few years ago, she was the model for my fine art print, Circles of Thought. My friend Kellen did a watercolor sketch based on artwork by Alberto Vargas. I took Kellen's finished sketch and made this composite with the help of my friend Sheyenne Rivers. I asked Sheyenne to be the model for this project because her curvy body matched the sketch almost perfectly. I set the lighting and posed Sheyenne as close to the sketch as possible. We actually did about 30 shots, making small adjustments in posture, camera angle, etc. Finally, I scanned Kellen's sketch and combined it with the best matching photo of Sheyenne. It was a fun project and I hope to do more like it in the future. I also added this photo to my web site. 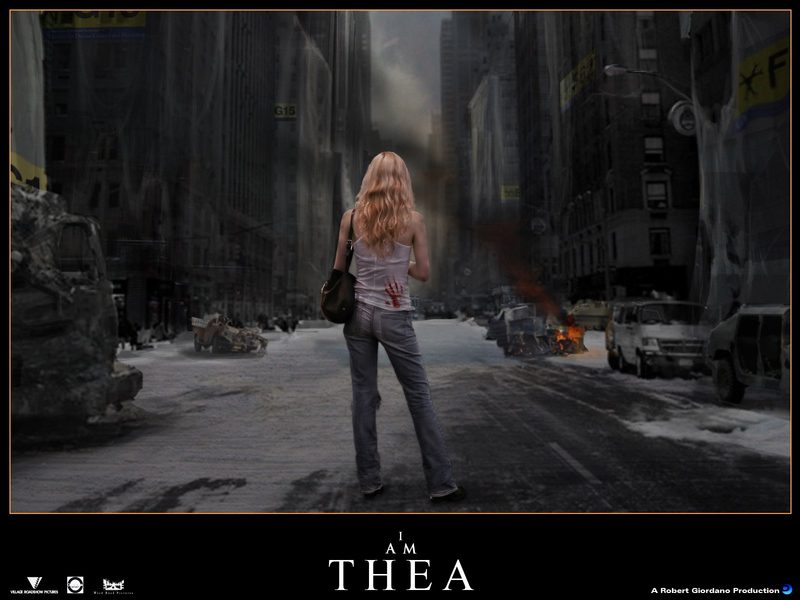 This is my friend Thea, in a zombie apocalypse. First, I took a picture of her while she was in Whole Foods, deciding which organic vegetables to buy. Next, I found some preliminary artwork for the movie, "I Am Legend" and I created this mashup. In case you're wondering, she didn't have a bloody hand print on her shirt when she was at Whole Foods. Her clothes were much cleaner too. 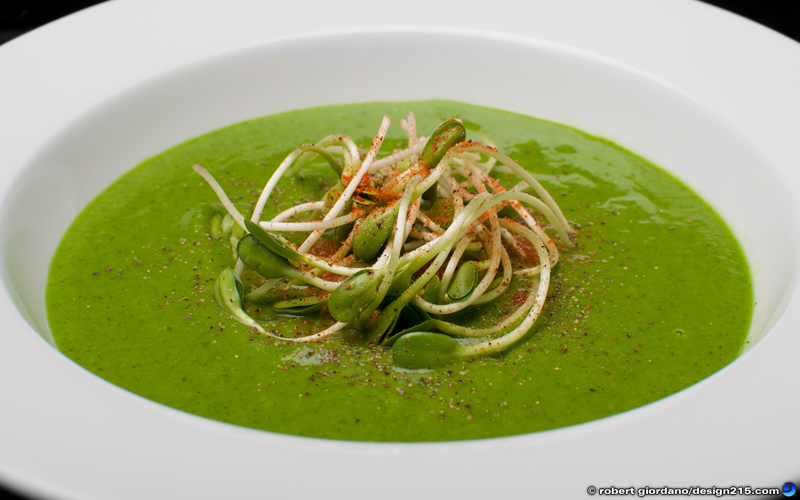 This delicious, creamy soup packs more nutrition than 10 salads! Not feeling well? Have a couple bowls of this soup and you'll feel better in no time. This is a raw soup, best enjoyed chilled. You could warm it slightly as long as it stays below 105 degrees. Mix all soup ingredients in a blender until smooth. Top with garnish. Makes 3 to 4 servings. Nikon D90 with Nikon 35mm f/1.8 lens. Exposure: f/8 1/125 ISO 200. Studio strobe with softbox.